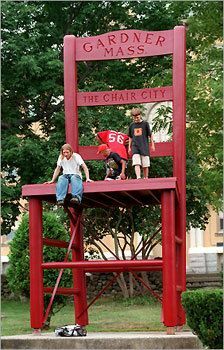 Gardner, a town in Central Mass just west of Fitchburg, was once known as Chair City. The furniture industry started here in the mid-19th century and by 1910 had grown to 20 chair factories producing four million chairs per year, employing thousands. Major companies like Heywood-Wakefield, Conant-Ball and Nichols & Stone made heirloom-quality furniture—carefully handcrafted pieces meant to be passed down from generation to generation. Then deindustrialization hit. Jobs shifted to the American South, then South Asia. Heywood-Wakefield closed in 1979, Conant-Ball in 1980. Nichols & Stone lasted until 2008, when it was wiped out by the financial crisis. Hundreds of people in Gardner were terminated, left with no way to use their skills. Chair City now exists in name only—Gardner produces only a tiny fraction of the furniture it once did. This, of course, is a story that’s been repeated over and over in America and elsewhere. Globalization, deindustrialization, and automation have continued apace for decades and will only pick up pace as time goes on. This represents a pressing problem for democracy. As the profits of globalization flow to a tiny elite, they wield power disproportionately, while the workers left behind are disillusioned and fearful that their own real incomes and those of their children will continue to stagnate or worse. This has led to middle classes around the world experiencing an increasingly pervasive sense of dissatisfaction and unfairness—which, sadly, has in turn led to the scapegoating of immigrants and minorities. Hence the rise of Trump in America, Brexit in Britain, National Front in France, Alternative for Germany, and on, and on. One answer to this darkening trend is provided by the humanities: what if, in the towns abandoned by industry, we used history to help people make sense of their situation? To help people heal? That’s precisely what Central Mass native and Mass Humanities grantee Tracie Pouliot has done. A couple of years ago Ms. Pouliot opened the Chair City Community Workshop in Gardner. 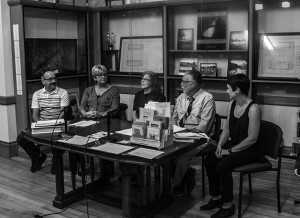 There, with help from a Mass Humanities grant, she launched the Chair City Oral History Series, a collection of reminiscences collected from former employees of Nichols & Stone. Each interview was converted into a handmade book, printed in editions of about 400 copies on letterpress, using handset type, polymer plates and woodcuts. The finished books are given to local people who worked in the furniture industry, and copies are donated to the Gardner library and museum. The workshop’s art center houses the production of the books, as well as providing a space where residents can rebuild the social networks that were lost when the factories closed. 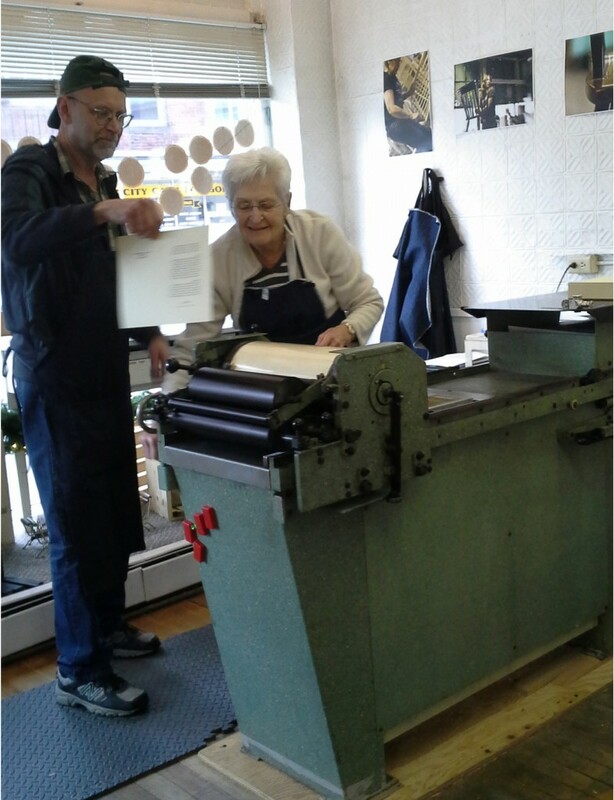 Community members can learn how to use the letterpress, bind books and construct the finished product. Ms. Pouliot received a bachelor of fine art degree from Pratt Institute in New York and a master of art in community art from Maryland Institute College of Art. The events in Gardner brought her home, though, where she was determined to make a difference. Ms. Pouliot was able to interview twelve people in 2009, a year after the factory closed. That led to a book-making process that is still continuing today. When he says “everyone,” he means generations. Nichols & Stone had been in business for 151 years. The Mass Humanities grant to Ms. Pouliot’s organization was intended to support two things: the creation of the books themselves and, importantly, public discussions about them and why the project existed. This is where the public humanities shine. The first panel discussion the Chair City Community Workshop organized included Denis, two additional furniture workers named Barbara and Dale, and Dr. Robert Forrant, a labor historian from UMass Lowell. The venue was packed and old friends reconnected for the first time in years. The former furniture workers talked about their pride in the product they made, what working alongside each other meant to them, their heartbreak when the factory closed, and their deep regret that the work that defined Chair City is gone. A woman raised her hand: “Why did the factories all close?” Instead of turning to Dr. Forrant, Denis and his co-workers explained what happened. They talked about how banks and investors limited access to funds; how despite technology upgrades and the level of skill in Gardner, production moved overseas where labor was cheaper; and how the financial crisis dealt a final blow. “Working class people across the country have these experiences and knowledge, but it often goes unacknowledged,” said Ms. Pouliot. “As Denis and his colleagues talked about deindustrialization, financialization and neoliberal trade policies, the whole room nodded along.” Dr. Forrant added that workers in blue collar towns like Gardner are made to feel like it was their fault; that along with heartbreak and hardship comes undeserved shame, substance abuse, physical and mental health problems. He affirmed economic and political trends the workers had experienced; he validated their knowledge and experience. Gardner has an important story to tell. It’s a story that resonates across the world, and the process of telling the story is rich with the potential to solve these problems and create a productive, and hopeful, future.